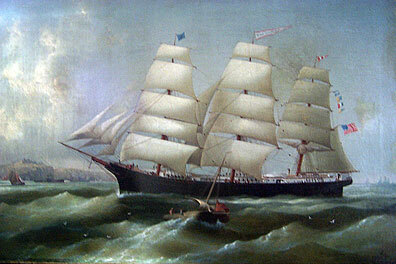 Ship built by H. McGilvery, Belfast, Maine in 1871 for James G. Pendleton and others. Traded to Europe and the Far East. Sold for use as a barge in 1893. Fedeler had trained as a marine artist under his father C.J.H Fedeler. Besides ship portraits, his paintings included many seascapes.